Warwickshire strengthened their position at the top of the Specsavers County Championship Division Two table by completing an eight-wicket win over Derbyshire before lunch on the final day at Edgbaston. Requiring 89 for victory Warwickshire resumed on the last morning on 19 for one and Ian Bell set the tone for a comfortable closing out of victory by driving Duanne Olivier’s first ball sweetly through the covers for three. On a turning pitch, leg-spinner Matt Critchley was Derbyshire’s main hope of pulling off an unlikely win and he struck in his second over of the day when Dominic Sibley fell lbw. 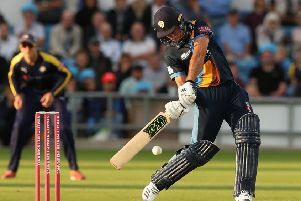 But that glimmer of hope for the visitors was effectively snuffed out in Critchley’s next over from which Jonathan Trott took ten runs, including two cover-driven fours, to take his team past 50. That flurry saw Critchley taken out of the attack and 17-year-old, Kandahar-born, England Under 19s off-spinner Hamidullah Qadri brought into the attack. Trott soon punched him to the long-off boundary and, fittingly, in the match during which he announced that he will retire at the end of the season, went on to see his team through to victory. Trott ended unbeaten on 35 (45 balls, seven fours) and Bell on 34 (53 balls, six fours). Warwickshire’s victory was built upon a solid display with the bat which saw them pass 400 on a wicket which required watchfulness and the excellence of Jeetan Patel and Henry Brookes with the ball. The pair shared 18 wickets (Patel’s match-figures ten for 170, Brookes’ eight for 119) to more than compensate for the loss from the attack of Ryan Sidebottom who suffered a side-strain while bowling in Derbyshire’s first innings. Derbyshire were left to reflect upon match which ultimately brought an emphatic defeat but in which they competed for long periods to suggest they are capable of sustaining their bright start to the season.